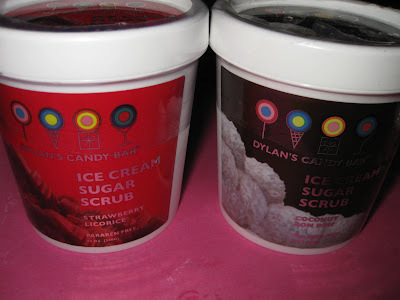 Kalifornia Love: Dylan's Candy Bar Ice Cream Sugar Scrub in "Straweberry Licorice"
Dylan's Candy Bar Ice Cream Sugar Scrub in "Straweberry Licorice"
Yesterday I posted my Sephora haul which included some Dylan's Candy Bar goodies. 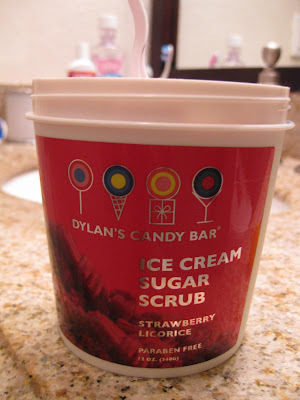 During the week, I finally got a chance to test out the Ice Cream Sugar Scrub in yummy Strawberry Licorice ($10 on sale.) The only body scrubs that I've ever used are The Body Shop scrubs and my own olive oil and sugar mix (cheap and effective.) Here's a little review on my experience. The Packaging: I simply adore the packaging on all the Dylan's Candy Bar products. 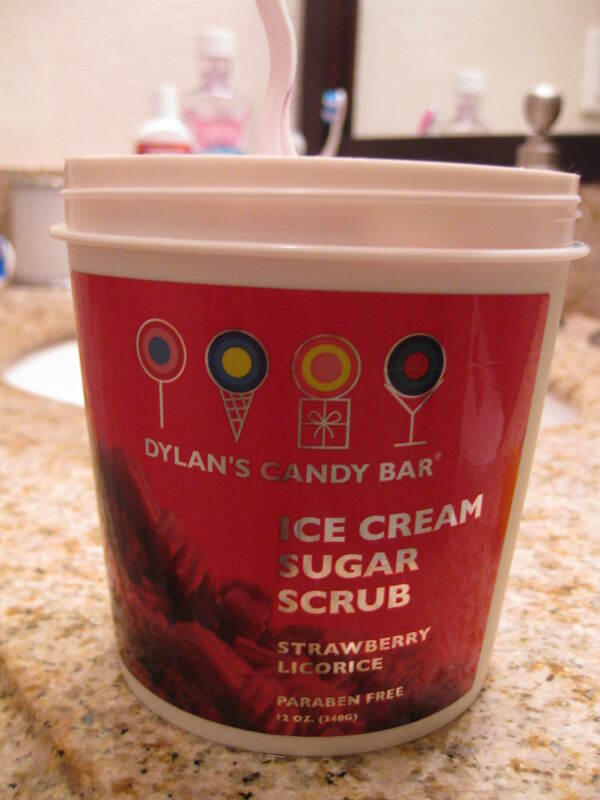 The Ice Cream Sugar Scrub tub looks much like its name -a carton of ice cream! The lid twists off -which keeps its contents inside secure. I like the labels on the carton too -so colorful and tempting. 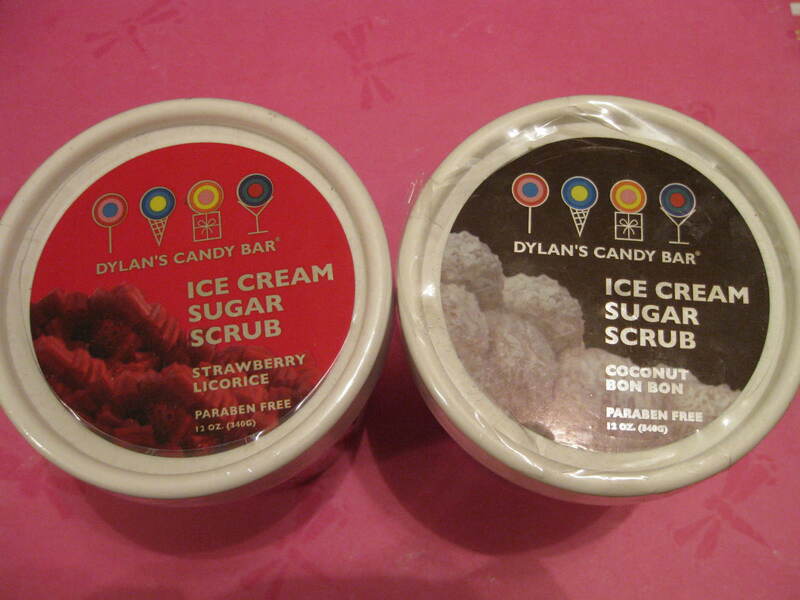 The Product: The scrub is very smooth and the "sugar crystals" (is it real sugar??) is pretty fine compared to other scrubs that feel way more gritty and harsh. When just looking at it, you can't really see any grainy-ness -it looks so smooth (see pic below.) 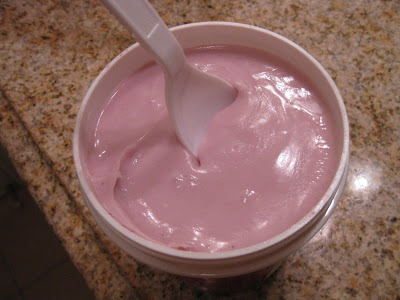 The texture is somewhat inbetween -not so thick like most scrubs I've tried but not so runny. It's sort of feels slightly thicker than yogurt -but with fine crystals (for scrubbing action.) When I used it, it didn't feel rough against my skin. The scrub felt very gentle since it wasn't very thick and the crystals were so fine. I feel like it did a good job exfoliating my skin and getting the dead skin and dirt out while being very gentle to my extremely sensitive skin. The Scent: I LOVEEE the smell of this stuff. Usually I hate things that are too perfumy or have an artificial smell. "Strawberry Licorice" smells so sweet -not exactly like strawberries but like candy and other sweet stuff all mixed together. I really can't describe it. The smell was so good I was tempted to eat it! The scent also lingers a small bit after bathing. Overall: I cannot see myself paying the original price of $20 for this when it's probably going get used up fairly quickly. For $10 though, I might want another carton/tub of this stuff but I wouldn't be crazily stocking up on it. Sure the smell is nice and the product is good but it doesn't work any better than my own mixture of olive oil and sugar to exfoliate my body. I think that The Body Shop scrubs do a better job at getting rid of the dead skin and dirt although this Ice Cream Scrub is gentler. Overall, it's a pretty good product for $10 but is more of a luxury item than a need. This is random but last night, I was so so craving a Kit Kat bar. I searched the house for one or at least some good chocolate without luck. I was pretty bummed but when I looked in another cabinet, I found this!! 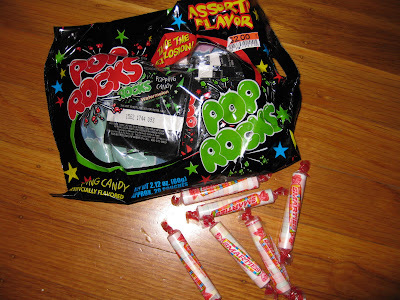 A whole big bag of Pop Rocks -one of my absolute favorite candies. I was so happy. I also found a huge bag filled with Smarties so I ate a pack of those too.What's your favorite candy? The best part while dealing with this company is the top quality solutions they provide. This is a great information about the popular ice-cream hubs. I would like to visit that place once in a life currently I'm working with an online organization which provides Online Viagra at a low price. I read all the article it is the best article ever so the real fact is Buy Viagra Online is the best. Buy etizolam online to treat your anxiety.